More so than any of his other records, The Landmark makes Awol One's laid-back gruffness feel like a crafted persona, one whose elements don't quite work together. 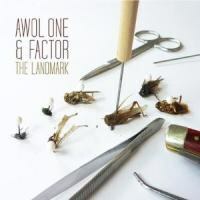 It may be a bit odd, but you certainly can't call Awol One & Factor's approach to rap music uninteresting. At its very best, their combination -- Factor's beats and Awol One's voice, both dusty and ragged -- works well, and though it's a sound that lands outside the comforts of hip-hop trends, their work is distinct and stubbornly willing to stay out in the cold. The Landmark, however, is best when they break from their self-imposed isolation and invite others in to play. On "Daze Go Bye", Factor deals in faint yet haunting atmospherics, churning them up over murky drums, and Awol One deals out his most complex rhymes on the record. Breaking from his speak-singing, end-rhyme-heavy default delivery, his word play gets much more intricate and interesting here. Perhaps he's trying to keep up with Buck 65, who has proved in the past that this dusty sound can work, and who slips in here with a tight verse. His line about a Darryl Strawberry rookie card is worth the price of admission alone. "One Live Tape" serves as a nod to the old school, with a more straight-up beat peppered with scratches. Abstract Rude and Ahmad serve as counterpoints to Awol One, delivering energetic, slippery lines that play well against his trudging, grizzled voice. These moments -- along with more humble successes like "The Wasp" and "Never Gonna Take Us Out" -- show the best that these two have to offer. They employ Awol One's straightforward knack for storytelling and weave that over Factor's intricate beats. Factor's use of echoing guitars and deep keys set his beats apart from most others, stepping into psychedelic territory most won't, and avoiding the allure of soul samples. But while Factor offers compelling beats, Awol One consistently underachieves on The Landmark. His delivery -- meant, perhaps, to be weary and world-wise -- comes off more like sleepy and apathetic too often. The moments where he legitimately raps, like on "Daze Go Bye", show us what he's capable of, but then he spends the rest of the record failing to challenge himself. He is still, as he has been for a while, a real bummer. Though he mixes in self-deprecation, and offers many thanks for those who support him, Awol One still seems to both deplore his self-destructive tendencies and revel in them. "Real Late" offers us the clearest picture of this, as Awol One actually amps up the energy on the verse, but then wastes a great, watery beat with a clunky chorus where he claims, "Stay out real late, and I get real drunk, / Singing my stupid songs, my family believes in me". Nevermind that there's an unapologetic grin to this that doesn't fly, but there's also no logical connection between these claims. They just lay there in the song, flat and ineffective, highlighting Awol One's favorite topics without actually saying much at all. More so than any of his other records, The Landmark makes Awol One's laid-back gruffness feel like a crafted persona, one whose elements don't quite work together. There's a subtle defiance to his songs -- "Don't be afraid of the media", he insists in one big-statement moment -- but he can't seem to muster the energy to make his vitriol believable. Factor, no matter his compelling beats, might not help much in the end either. His beats are mid-tempo, chugging along, leaving space that a more verbose rapper could fill. That's not Awol One's bag, though, and instead he half-sings -- or half-raps, whichever you prefer -- sluggishly over the interesting beat work of "Perfect Opposites" and "Frenemies" and deflates their natural energy. It's one thing to try and sound like a slacker, one that might surprise us with a sneaking wisdom; it's a whole other thing, though, to just slack off, and unfortunately we get far more of the latter than the former on The Landmark.